Happy Holidays, all! I am running my first and ONLY sale of the year for the Thanksgiving holiday weekend, Friday Nov. 24 through Monday Nov. 27, 2017. Get 50% off your session fee for studio, Fresh 48 and in-home lifestyle sessions when booked between December 2017 and May 2018. 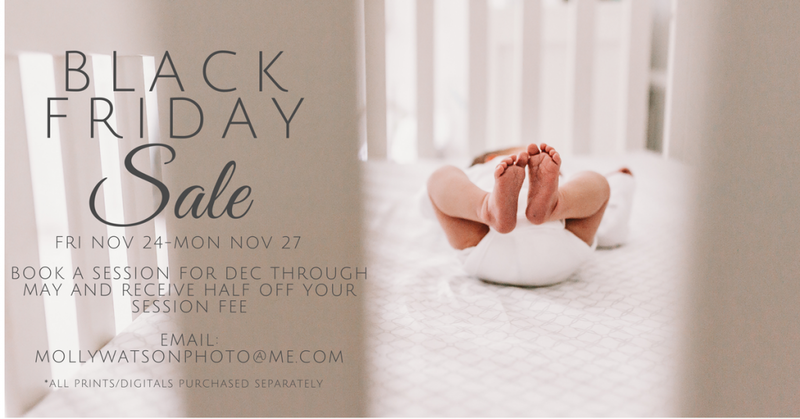 To receive this discount, you must email me at mollywatsonphoto@me.com or one of the buttons below! Your email must be received between 12:00am Friday Nov. 24 and 11:59pm Monday Nov. 27 to receive the Black Friday Sale! All sessions require a signed contract, completed questionnaire and session fee as retainer in full at the time of the sale booking dates. An online client portal will be set up for you to complete the booking. Photographed with a documentary, storytelling feel...exactly how you want to remember those moments. Perfect for family and/or welcoming your newest little one! Images taken within the first 48 hours after your little one is born at the hospital or birthing center. Photographed "lifestyle", capturing honest moments of those important days you never want to forget!